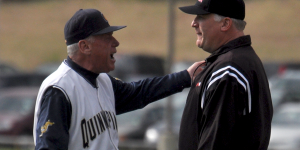 Sometimes the baseball gods smile on you, Quinnipiac head coach Dan Gooley often says. But they haven’t been smiling too much of late on the Quinnipiac baseball team. The Bobcats, who trailed by seven runs in the ninth inning, had the game-tying run in scoring position with two outs, but their comeback bid fell short to Rhode Island, 8-6 on Tuesday at Quinnipiac Baseball Field. The Bobcats (3-26) trailed 8-1 entering the ninth, but managed to cut the deficit to two on six walks, an RBI single and a wild pitch. But with runners on second and third and two outs, freshman Vin Guglietti grounded out to first to end the game. “We competed and battled back, and when you can do those types of things you can play on an everyday basis,” said Gooley, whose team has lost 13 games in a row, the fourth-longest active losing streak in Division I.
Rhode Island pitchers Brendan Doonan, Matt Young and Mike Bradstreet walked the first six Bobcats in the bottom of the ninth. Quinnipiac catcher Chris Caldari hit an RBI single to left to make the score 8-5 and bring up the potential game-winning run with nobody out. But Bradstreet pitched out of trouble to earn his seventh save of the year. Brian Ruditys struck out looking and Jesse Ullrich grounded into a fielder’s choice to the pitcher. After a wild pitch, Guglietti, who hit his first-career home run in the seventh, grounded the ball to first to end the game. “Our mindset was simple: make them throw strikes and see what happens,” Gooley said. The Bobcats found themselves down five runs after the second inning. Pitcher Matt Lorenzetti (0-2) struggled, walking four and allowing four hits and five earned runs in two innings. Pitchers Matt DeRosa, Derek Lamacchia, Spencer Kane and Nick Fabrizio combined to throw six innings of shutout ball. In the top of the ninth, Kevin Adler allowed three runs on two hits, a walk and an error. “You have to get 27 outs, whether the kid’s going to have trouble in the first inning or somebody’s going to get in trouble in the ninth,” Gooley said. Jeff Cammans went 4 for 5 with three RBIs and starting pitcher Liam O’Sullivan (3-0) tossed 6 ⅓ innings of one-run ball for URI (17-13). The Bobcats hit into four double plays in the game, including a line drive to right field that Joe Landi dove and caught and threw to shortstop Tim Caputo to double up Zak Palmer. Palmer was also caught stealing on a strike ‘em out, throw ‘em out play in the bottom of the seventh. Guglietti hit a solo shot to right to lead off the bottom of the seventh.